Something all too rare happened at the end of the Boston Lyric Opera’s performance on Friday night: a living composer took a bow from the stage of the Shubert Theatre. Any responsible mainstream opera company must not only curate the art form’s illustrious past but also engage itself with opera as a living entity. BLO had not brought a contemporary work to the Shubert Theatre since 2005. That the company has returned to this terrain is to be applauded. 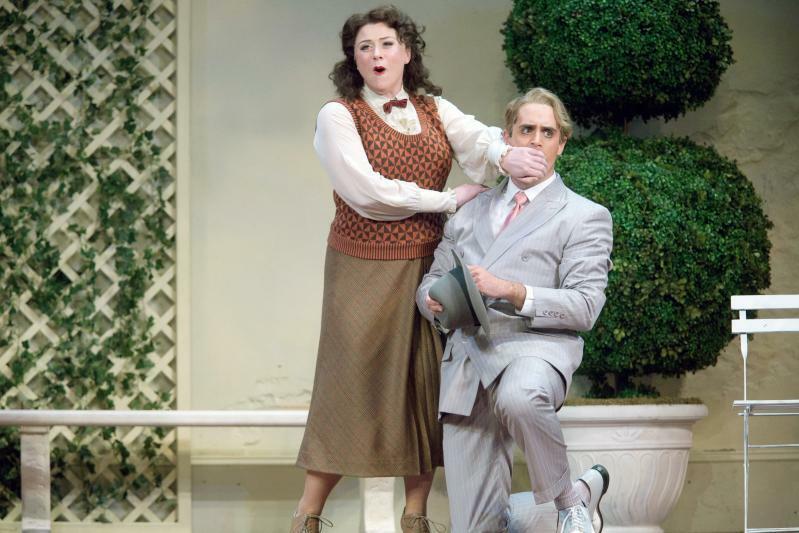 That said, I wish I had more positive news to share about this particular opera, “The Inspector” by John Musto, which was given its world premiere last year at the Barns at Wolf Trap in Virginia. It is based on Gogol’s celebrated satire “The Government Inspector,” about a small town put on edge after learning that a government official has been sent in disguise to investigate local corruption. The town’s officials mistakenly suspect an innocent visitor, and much trenchant comedy ensues. Somewhere in this play — which Nabokov called the greatest in all of Russian literature — is the blueprint for a great comic opera, but alas, “The Inspector” is not it. A pianist and veteran song composer, Musto has written four operas with the librettist Mark Campbell, who has here transported the story to Mussolini’s Italy. The libretto he has created is packed to the breaking point with rhymes: clever rhymes, silly rhymes, banal rhymes, rhymes that ask you to guess where they’re headed, rhymes that make you groan. The relentless verbal preening becomes in itself a tiring distraction. There are also topical references — to Bush, to Nixon, to homeland security — and we are clearly meant to feel the contemporary resonance in this timeless story of bureaucratic corruption. And yet far more effective in making this opera feel relevant would have been creating characters in whom we could actually recognize aspects of ourselves or our political leaders. Instead, Musto and Campbell have given us a stage full of exaggerated comic ciphers. First and foremost is the mayor of the small town of Santa Schifezza, a walking bundle of clueless self-love and venality, who at one point literally shakes his fist in the air, shouting about “power.” The mayor’s wife, convinced she is destined for a glamorous new life in Rome, belts out an over-the-top paean to shoes, all the varieties she will soon have in her closet. “Shoes! Shoes!” It’s Imelda Marcos channeling John Adams’s Nixon (“News! News!”), minus the poetic depth and contagious energy. Maybe you’ll find it all funnier than I did. Musto’s score has color, and is crafted with care and professionalism, full of period touches, nods to musical theatre and various Italian dances. But the music often feels overly deferential to the libretto, and almost never takes enough distance to lend the stage action the extra dimensionality it so desperately needs. The writing in a scene during which the mayor’s daughter bids farewell to her parents, after having duped them to run off with the would-be inspector, stands out for its sensitivity. For a brief moment, a set of real-life complex emotions seems to have intruded on this circus of slapstick. It’s almost out of place. Leon Major’s production, adapted from the original Wolf Trap staging, is fluid and occasionally witty but can only do so much. Erhard Rom’s set spins attractively. The vocal performances were generally solid, with most of the cast overacting to fill this opera’s void. Jake Gardner was the Mayor, Victoria Livengood his wife, Meredith Hansen their daughter Beatrice. Neal Ferreira was Tancredi, the dissident student fleeing Rome before being mistaken as the inspector, and David Kravitz, a standout, was his would-be valet Cosimo. Smaller roles depict other corrupt officials. Conductor David Angus drew serviceable playing from the BLO orchestra. Ultimately, I left the evening wondering about strategies for presenting modern opera, and certain myths of gradualism and accessibility that often seem to hold sway among presenters. If contemporary works can be box office poison for a mainstream company, the thinking goes, best to introduce the concept of opera by living composers through “safe” pieces like “The Inspector” or Rachel Portman’s “The Little Prince,” the last modern work BLO put on its mainstage subscription series. Such works don’t aggressively push listeners somewhere new, or challenge them with bracing contemporary idioms. And yet what exactly is the audience left with after a work like “Inspector”? Now that BLO has begun to program more boldly — “The Lighthouse” earlier this season was a triumph — the company should have the courage of its convictions. Safe risks can sometimes turn out to be the riskiest of all.